Catching up on my column for Macmillan Dictionary Blog, I have three recent posts to share. To look more broadly at these ripples in the collective lexicon, we can turn to big data in the form of language corpora. One of these, the Spoken British National Corpus, allows many kinds of linguistic research, such as studying how English vocabulary and regional dialects are shifting. The project was in the news recently with a story about ‘words we no longer use’. The headline exaggerates, but there are indeed words we use much less – or much more – than we did twenty years ago. The corpus data can illustrate how our lives have changed over the years. Efficiency is intrinsic to communication, and can drive language change. Set phrases that are used repeatedly are commonly abbreviated, as they save people time and effort. In digital communication, abbreviations may also serve as tribal markers – tfw users are in the know about internet lingo. Ikr. Sometimes, as in the case of lol, abbreviations may even undergo grammatical transformation. Quean is a notable word in its own right. It comes from Old English cwene, meaning ‘woman’, from Proto-Indo-European *gwen-, which is also the root of queen, misogyny, and gynaecology. In English, cwene was originally a neutral word; but like many terms of female reference, it gradually took on negative senses and connotations, coming to mean ‘impudent woman’, ‘hussy’, and ‘prostitute’. In Scots it has retained its original neutral sense. Each post is bite-sized, readable in 2–3 minutes. For more, you can browse the full archive. ETAOIN SRHLDCU, or: What are the most common words and letters in English? 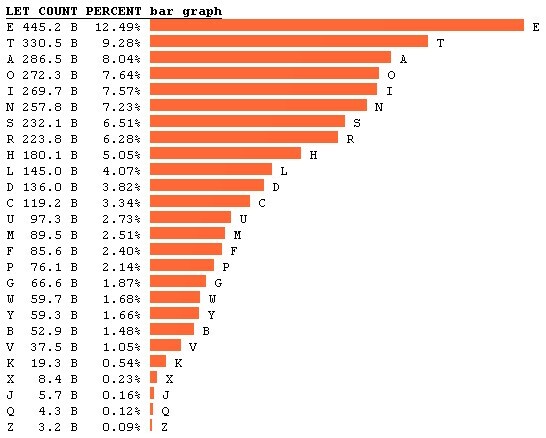 Most of us know that ‘e’ is the most common letter in English and the is the most common word. Many are familiar with ETAOIN SHRDLU, the nonsense string that used to appear in print because of early-20thC printer design and now serves as shorthand for the most popular letters. Beyond prevailing lore and trivia, we’re generally less certain about the English language’s most common words and letters. Different studies over the years have produced varying results, depending on the datasets and methods used. As you can see, it violates ETAOIN SHRDLU only slightly, becoming ETAOIN SRHLDCU. The 50 most common words, in order of frequency, are: the, of, and, to, in, a, is, that, for, it, as, was, with, be, by, on, not, he, I, this, are, or, his, from, at, which, but, have, an, had, they, you, were, there, one, all, we, can, her, has, there, been, if, more, when, will, would, who, so, no. I have two new posts up at Macmillan Dictionary Blog. If you subscribe to it, or follow me on Twitter, you may already’ve seen them, in which case please indulge or disregard. It has improved the datasets and publisher metadata and added many more books to the corpus, so the results are more accurate and comprehensive than before. The interface remains much the same – you can modify searches by timeframe, degree of detail, and corpus type, including several different languages – but it comes with a whole new bag of tricks. A significant innovation is the ability to search by part of speech. Say you want to look for a word as a verb, but it also functions as a noun. Just append “_VERB” to your search term – the capital letters are essential – and the Ngram Viewer filters accordingly. See colour’s conspicuous double-dip in early-19th-century U.S.? Read on for my interpretation of this shift. My latest piece, Getting ‘treacle’ from wild animals, traces the strange origins of treacle, beginning with the Proto-Indo-European root *ghwer– “wild”, from which we get Latin ferus (→ fierce, feral) and ferox (→ ferocious). *Ghwer– also gave rise to the Greek word thēr, meaning “beast” or “wild animal”, whence the diminutive thērion – a word Aristotle used to refer to vipers. We see the same root in Therapoda (“beast feet”), a category of dinosaurs . . . . From thērion came thēriakos (adj.) “of a wild animal”, which led to thēriakē “antidote for poisonous wild animals”. Latin borrowed this as theriaca, which became *triacula in Vulgar Latin. From this we get Old French triacle “antidote”, subsequently imported into Middle English and later to become treacle. Treacle was used especially against venomous bites such as snakes’ – the remedy often included snake flesh – then gradually the word’s meaning shifted from antidote to general cure or prophylactic. Sir Thomas More mentions “a most strong treacle against those venomous heresies”. Eventually the medicinal connotations faded. You can read the rest of this peculiar etymology at Macmillan Dictionary Blog, and older posts are available here. Michael Rundell, a lexicographer at Macmillan Dictionary, wrote last year about a new area of linguistic research “based not on conventional corpora, but on Twitter feeds”. The demo website he linked to has since been updated, and is worth another look. The Second Edition of the Oxford English Dictionary contains full entries for 171,476 words in current use, and 47,156 obsolete words. To this may be added around 9,500 derivative words included as subentries. Over half of these words are nouns, about a quarter adjectives, and about a seventh verbs; the rest is made up of interjections, conjunctions, prepositions, suffixes, etc. 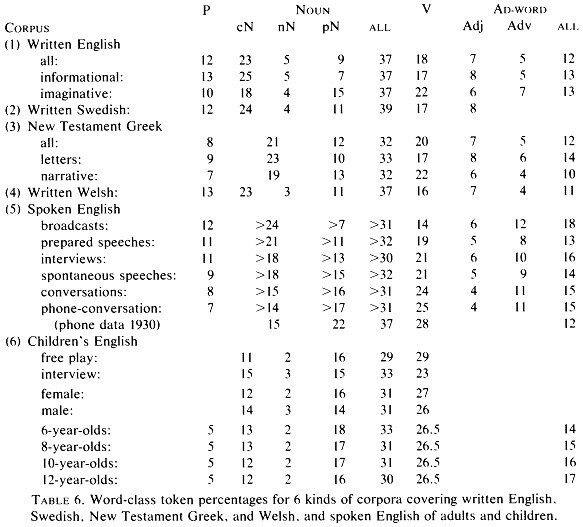 These figures take no account of entries with senses for different parts of speech (such as noun and adjective). In any language, the nouns make up by far the largest category in terms of number of dictionary entries, and in texts we find more nouns than words of any other category (about 37 per cent of the words in almost any text). Evidently there had been systematic investigation. I soon found what I presume was the authors’ source: “About 37% of Word-Tokens are Nouns”, a paper by Richard Hudson that appeared in Language in 1994. Hudson, an emeritus professor of linguistics at University College London, examined two major corpora and related studies: the Brown University corpus of a million words of written American English, and the Lancaster–Oslo–Bergen (LOB) corpus of a million words of British English. More detailed examination of the word types in genre categories reveals that the proportion of nouns varies, as we would expect it to, but only between 33% (in learned & scientific writings) and a more “nounful” 42% (in press reportage). Hudson speculates on possible causes for the observable patterns and variations, notes that the generalisation in his paper’s title is an “oversimplification of a system which is complex but quite regular”, and describes the trends as “facts . . . in search of a theory”. Hudson concludes that language has “regularities which involve the statistical probability of any randomly selected word belonging to a particular word-class”. I haven’t looked for follow-up studies yet, so I don’t know what has been made of these and similar data since 1994, but it’s a fascinating paper in its own right.